It strikes me as more than a little odd that the US Secret Service has provided such seemingly piss-poor protection to Obama, especially since he’s supposedly the most threatened POTUS is recorded history. 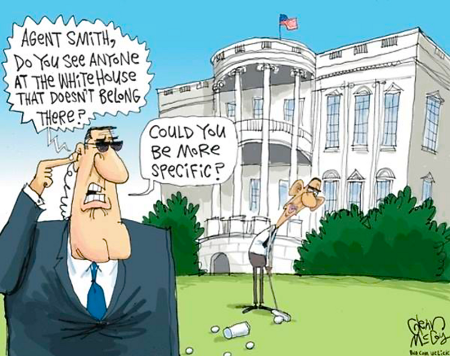 It sometimes makes me wonder if the Secret Service doesn’t actually believe that protecting Obama from assassination is actually in the best interests of America. It’s quite common for people to bemoan rainy days, to think of them as days in which one’s plans are damaged or ruined and to feel depressed and out of sorts when they occur. In the Civilized World, especially Britain and America, the “poor,” most especially the “working poor” misthink a lot. They truly mistake their place in the scheme of society and economics and, because of this, have replaced pride with hubris. I wonder about people who think that those who are poor shouldn’t demand reciprocity from their employers. We should devote ourselves to something that doesn’t benefit us more than it absolutely has to? We’re meant to care about their best interests, but they don’t have to care about ours? If you’re going to put as little as possible into my training and wages, if you’re going to make sure that I can’t get enough hours to survive in order to avoid giving me healthcare, and generally make sure that I’m as uncomfortable as possible at any given time just to make sure I know my place, then how can you expect me to care about your profit margin? This is an all too common failing though more detrimental to both individuals and nations when coming from the “poor.” They conflate their worth as people with their worth to their employer and almost always over-inflate and overstate that importance. 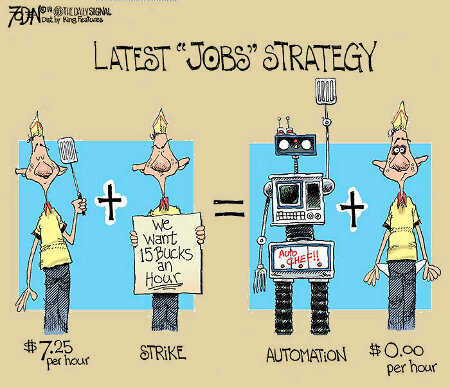 What these people fail to realize or, at least, fail to accept and internalize is that the only reason that they have one or more jobs is that, at the current time, it’s more feasible and/or cost effective for employers to employ them than it is to either outsource the work or replace the bulk of the labor process with automation. They can’t or won’t grasp the simple concept that they’re by and large disposable and interchangeable parts insofar as the context of their work is concerned and that this is the basic, incontrovertible nature of very low-level, largely unskilled labor. Obama’s latest Secretary of State, John Kerry actually publicly said that the threats posed by Climate Change should be addressed with as much “immediacy” as confronting ISIS. Yes, it’s true; Kerry believe there’s a direct correspondence between these threats. 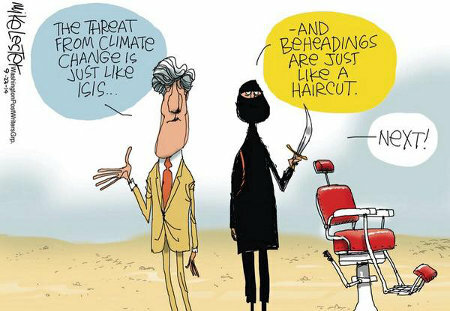 I suppose he’s close to right…if there’s a similar correspondence or equivalency between beheading and haircuts. Hal Yawm! 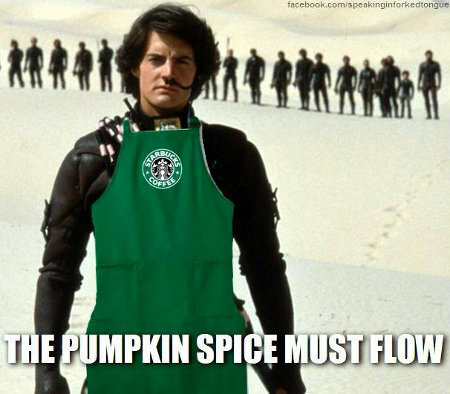 Chai-Hulud, called at times, “The Great Barrista,” demands that the pumpkin spice must flow. Kull Wahad!